NEW YORK (CNNMoney) -- Networking giant Cisco late Wednesday offered a very cautious outlook for the near future. As CEO John Chambers sees it: The global economy isn't yet getting worse, but businesses around the world fear that it may soon. As a result, they're becoming hesitant to spend. Cisco said its customers are buying cheaper products, requiring more managers to sign off on purchases and holding off on upgrades. Shares of Cisco (CSCO, Fortune 500) plunged 9% on Thursday after the company said it expects sales to grow just 2% to 5% this quarter, short of Wall Street's forecasts. 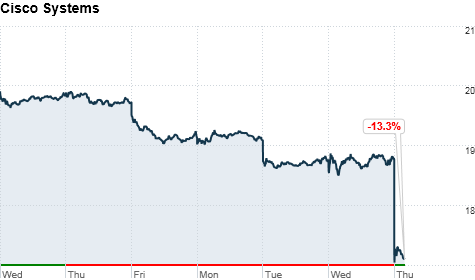 The stock whacking came in the wake of what was a pretty decent previous quarter. For the three-month stretch that ended in April, Cisco's sales rose 7%compared to last year, and its profit increased 20%. Chambers admitted that the company's guidance is conservative and acknowledged that not much has changed in the macroeconomic environment over the past several months. But there have been worrying signs, he said. Europe has gotten worse, sparking fears about the global economy and prompting some customers to slow their spending. Capital budgets, particularly for service providers like broadband and wireless carriers, were "very tight" last quarter, Chambers noted. In other words, uncertainty is the name of the game, even if businesses aren't yet seeing evidence of a global recession. "When I talk to our customers, they do not see that occurring in their environment, and they ... have said there plans are to spend more in the second half of the year," Chambers said. "However, in the very next sentence they said, 'We are waiting to see what happens in Europe and what happens with government policy.'" Spending in the public sector, including governments and schools, is expected to be flat going forward, but Chambers sees private businesses scaling back because of weaker consumer confidence. "We sure don't like the trend in the enterprise IT spending," Chambers said. "People are in this uncertain environment, and when they're uncertain, unfortunately, you don't spend." Other bellwether tech giants, including Hewlett-Packard (HPQ, Fortune 500) IBM (IBM, Fortune 500), Intel (INTC, Fortune 500) and Microsoft (MSFT, Fortune 500), haven't been nearly as cautious in their outlooks. So is this an economic problem or a Cisco problem? Chambers insisted that the company's global operations give it a broad and early view of what's coming. "One of the primary reasons Cisco sees these trends so much earlier than our peers in the market is we're pretty pervasive," Chambers said. "We're in every industry, every country, everything except the consumer in large volumes. And so we can see a hiccup in state and local spending in the U.S. perhaps two to four quarters before other people, our peers, get it on their radar screen." It wasn't all bad news. Cisco's emerging market sales grew at a robust 12% clip year-over-year, and Russia and Japan stood out as two particularly strong countries. Chambers also pointed out that Cisco is faring better than its competition. Juniper Networks' (JNPR) sales fell by 6% in the previous quarter, and Alcatel-Lucent's (ALU) revenue was down 12%. China's Huawei was up 3%, but Cisco's CEO noted that the company is in many emerging markets and should be growing sales even faster. Still, analysts on Cisco's conference call criticized the company for being too sensitive to economic trends. Chambers agreed and said that Cisco is looking to move into "macro-resistant" businesses that aren't as subject to ups and downs, such as entertainment and in-home video. That's why the company splurged on TV software company NDS, offering $5 billion for it in March. Chambers said he remains upbeat about Cisco's prospects despite the challenges. "Our results and guidance reflect the strength of our business in a cautious environment," he said. "We continue to see market trends early, and we believe we have the ability to lead quickly, both technologically as well as operationally."